Ceratonia is small genus of flowering trees in the pea family, Fabaceae, endemic to the Mediterranean region and the Middle East. 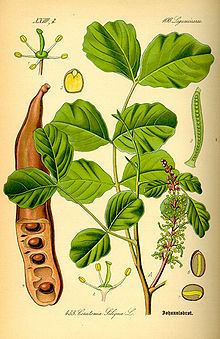 Its best known member, the carob tree, is cultivated for its fruits (called pods) and has been widely introduced to regions with similar climates. It belongs to the subfamily Caesalpinioideae. The genus was created by Carl Linnaeus and published in Species Plantarum 2: 1026 en 1753. The type specimen is Ceratonia siliqua. The genus was long considered monotypic (with only one species), but a second species, Ceratonia oreothauma, was identified in 1979 from Oman and Somalia. ↑ "'Ceratonia". Tropicos.org. Missouri Botanical Garden. Retrieved 8 August 2016. This page was last changed on 26 November 2018, at 23:56.